The Sun Mountain leather Sunday bag is constructed with supple, luxurious, 100% Mongolian yak leather and designed with care and meticulous attention to detail to deliver unparalleled quality and function. 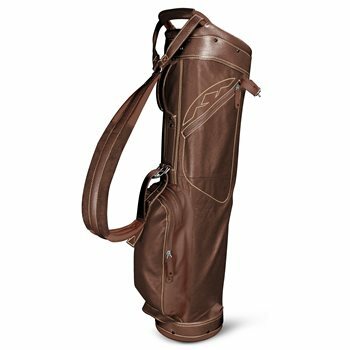 At 4.25 pounds, this bag is easy to carry through a round of golf with its adjustable single strap and three pocket design. One of these pockets includes a deep, velour-lined valuables pocket to protect your personal belongings. Additionally, this bag features a four divider top for club storage and a lift-assist handle built in to the top and bottom of the bag, making lifting and loading/unloading this bag extremely easy. Other features include a towel/umbrella holder and a pen holder.